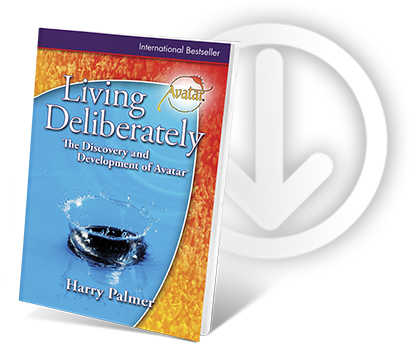 bestseller Living Deliberately by Harry Palmer. In 1987, an educator named Harry Palmer outlined an intriguing series of mental procedures. When correctly applied, these procedures unravel many of the more profound mysteries of human consciousness. For the first time, a clear interrelation between the operation of human awareness and the technologies of man could be demonstrated. Subjects as dissimilar as religion and physics suddenly found themselves sharing common ground. Concepts such as universal mind, mass consciousness, and extrasensory awareness moved from being dim and speculative to being tangibly experiential. Living Deliberately not only chronicles Harry’s search for a better way—for enlightenment—which ultimately led to the discovery and development of the Avatar materials, but also presents the background and foundation of The Avatar® Course in a clear and concise manner. You can also purchase the book, Living Deliberately, online at the Avatar Bookstore. If you don't have Acrobat Reader, a free download is available at the Adobe Acrobat Reader Download page. Please make sure you have Acrobat Reader before downloading the forms.